I don’t eat prawns, so it’s very difficult to cook something you don’t really eat and enjoy. At the same time it’s not fair to others at home. 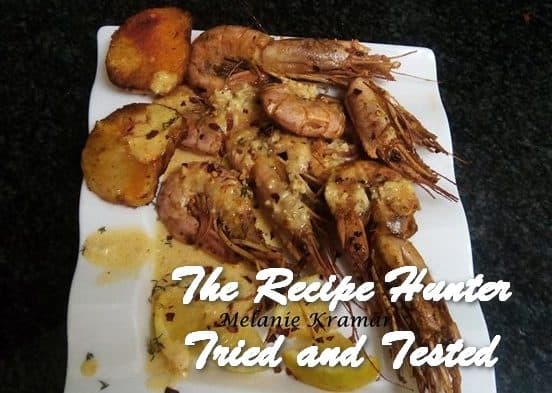 I decided to buy some prawns and give it a bash and though I’ve collected lots of prawn recipes I thought I’d start with a very simple basic one, after my brother had to show me how to devein and clean them 😊. The Olive Oil and Lime Prawns was well received and enjoyed. Peel and devein prawns keeping shells and head. Marinate the prawns in the lime juice, garlic and olive for 30 minutes. Add crushed chili flakes. Grill for about 10 minutes, turn over brush with garlic butter sauce and gill till cooked. Drizzle with more olive oil and lime juice and serve with extra butter sauce. Melt butter and add garlic. Add seasoning and lemon juice and simmer 2 minutes. Add fresh cream and bring to a boil. Hopefully you got some relaxation and recharged your batteries for the week ahead. Thank you for your concern. Yes I had a good quiet afternoon and now getting ready for 💤💤💤 time. Enjoy your sleep. See you Later Gator. Thanks, up and ready (or as ready as possible) for the coming week and month end. You are a work enthusiast.